After last week, we were worried we’d have to do some sanding or cutting to make the metal hold-down brackets fit, which might require a special tool and a lot of work, and/or trip to the Artisan’s Asylum, or the like. In an attempt to get the non-fitting brackets to cooperate in a way that would cause less of a delay, Owen tried what he called “careful application of a hammer”, or what I call “banging metal a bunch of times”. It worked. All of the brackets now fit, so we screwed them into place. What we now know is the brackets had tolerance built into them (they can be used with a range of measurements), so we could have helped ourselves out and made a wider distance from the threaded rod to the double stud to give us more flexibility. Tarp failure happened again, a couple days ago. The towel that was wrapped on the top of a wooden post did not do a good enough job of softening the stress on the tarp. A hole got poked through the tarp. We had to think about how best to fix this, and prevent this from happening again, without sinking time into setting up a whole new tarp system. I suggested duct tape but Owen said he tried that and it does not stick well to tarp when under stress. Owen added a horizontal wood piece (perhaps 2 feet long) to the top of the post holding up the tarp. 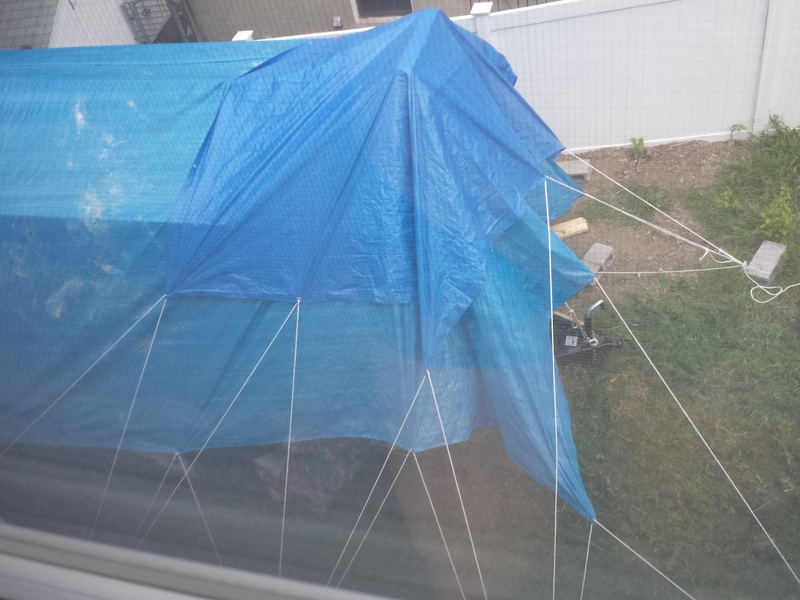 He also added two smaller tarps: One underneith the main one, and one over the hole (see today’s picture). As of writing this, the one over the hole just got blown out of place by a strong breeze, so it took more than half an hour to get it back into place, more securely this time. The tarp system only has to last a couple more months, possibly less, until the roof is on. We bought the Tumbleweed DVD http://www.tumbleweedhouses.com/pages/video, an instructional video from the company in which we bought our plans. Neither of us has watched all of it (mostly parts of Chapters 3. “Wall Framing”, and Chapter 4. “Loft and Roof”). So far there has only been one “Ooooh, yeah!” moment of seeing something we forgot to do. This was when they showed the technique for measuring whether a wall frame is square, prompting us to wish we had done before we raised the walls. On the other hand, most of what the people in the video are doing is what we did (although they have fancier tools and indoor space — no tarp hassle!). In fact, some of the closeups of the framing show that their results are rougher than ours.